A transformation of an EAD finding aid into GeoJSON. 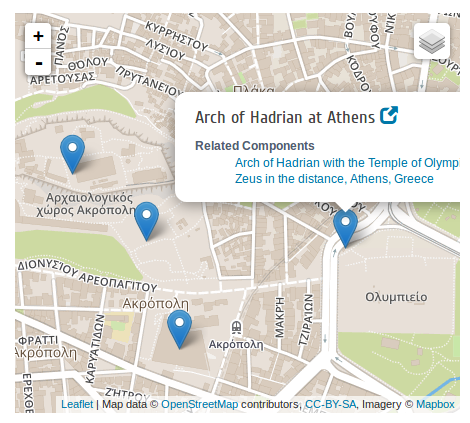 A GeoJSON point is created for all unique mappable places from Geonames or Pleiades, and coordinates are extracted in real time by reading Geonames APIs or Pleiades RDF. The GeoJSON features include references to all uniquely addressable components that include that place in the controlaccess element. You can append the extension '.geojson' to get JSON response. Content negotiation will be implemented eventually. See http://numismatics.org/archives/ark:/53695/nnan0037.geojson for example. Agnes Baldwin Brett was a curator at the ANS from 1909-1912 and a prominent scholar of Greek numismatics. Our archives hold a variety of interesting materials, including photographs from her travels around Greece, Italy, and Turkey in the early 1900s. Numerous photos have been digitized, were uploaded to flickr Commons, and linked to the Brett EAD finding aid. Some photographs were identified and described (with brief text snippets) by ANS archivist, David Hill, but all photographs were placed in a single series-level component. All identifiable places were linked in EADitor's Geonames lookup mechanism in a top-level controlaccess element. There was no direct correlation between individual photographs and the people, places, and things depicted. In order to demonstrate the full functionality of the new mapping interface, I finally took the time to restructure the finding aid so that each photograph would appear in its own item-level component with a controlaccess element enabling individual identification of the place depicted in the photo. Furthermore, while many finding aids have been linked to modern places defined in Geonames, the Brett collection of archaeological photographs provided an opportunity to link photos to ancient places in Pleiades, which would, in turn, open the door to the integration of these valuable materials into the wider Linked Ancient World Data cloud via Pelagios. The photos feature Mycenaean tombs, Greek temples, and even the Grave Stele of Hegeso. Not only that, some photographs feature other students from the American School of Classical Studies at Athens that went on to be prominent scholars later in life. Since many of these scholars have produced published works and archival materials held at other institutions, they have URIs in the Social Network and Archival Context project. 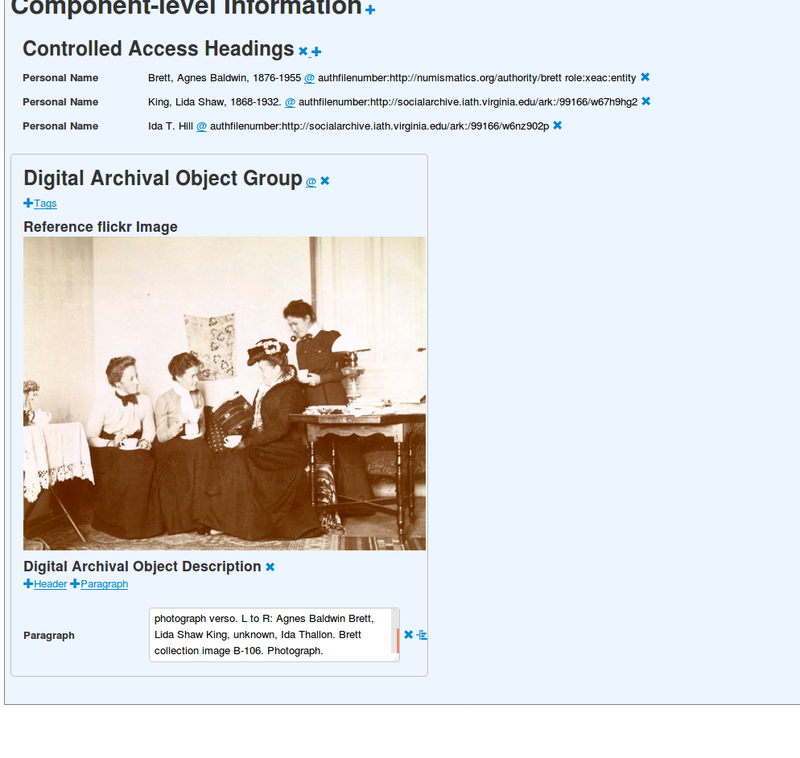 EADitor has had SNAC lookups for quite some time, and so I was able to link photos to these URIs when applicable. I hope that we can make these photos available to researchers even beyond the ancient world. In addition to the tagging of places and people, many photographs feature known archaeological monuments that are notable enough to warrant their own Wikipedia articles, and therefore Wikidata entity URIs. I extended the subject lookup mechanism in EADitor beyond the standard Library of Congress Subject Headings to query the Wikidata API, embedding entity IDs directly into the EAD finding aid, which are then transformed into dcterms:subject URIs upon RDF serialization. Since each individual component has an ID in EADitor, each component is uniquely addressable by fragment identifiers, e.g., http://numismatics.org/archives/ark:/53695/nnan0037#d1e131. After making some minor modifications to the RDF output to conform with the emerging schema.org archival extension, These Wikidata, SNAC, Pleiades, and Geonames URIs are exposed in the RDF for each component, which are hierarchically linked together. This RDF is posted into Archer's SPARQL endpoint. Now that we have numerous uniquely addressable photographs linked to Pleiades URIs published in our SPARQL endpoint, it was a breeze to create an RDF export for Pelagios. It is essentially a DESCRIBE query, and our model of RDF is run through XSLT into the Pelagios data model. The link to the Pelagios VoID is available on the front page of Archer. It is generated by an ASK query similar to above to see whether there are any objects in the SPARQL endpoint with Pleiades places expressed by the dcterms:coverage property. The Brett collection is incredibly interesting, and I hope that we will be able to digitize more photographs and the corresponding travel diary at some point in the future. There are still many photographs that haven't been identified, and so perhaps we might be able to accomplish this through crowdsourcing. We will implement a IIIF server by the end of summer and begin the transition of our archival materials into IIIF--not only photographs, but also the Newell diaries. Perhaps one day we will be able to annotate the people, places, and things from the Brett diary and photographs with Mirador or a similar IIIF viewer. While Pelagios integration is somewhat imminent, the aggregation of disparate archival holdings through shared SNAC identifiers is still further along the horizon.